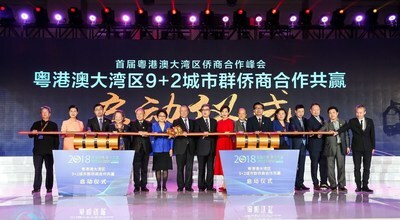 SHENZHEN, China, Nov. 6, 2018 /PRNewswire/ -- Co-hosted by Shenzhen Overseas Chinese International Association (SOCIA), the Friends of Hong Kong Association and the Macao-Shenzhen Economic and Cultural Promotion Association, the first Guangdong-Hong Kong-Macao Greater Bay Area (GBA) Overseas Chinese Cooperation Summit and the inauguration ceremony of the seventh Supervisory Committee of SOCIA was held in Shenzhen on November 3, 2018, with the aim of building an exchange platform for overseas Chinese entrepreneurs in and around the GBA. The attendance of overseas Chinese entrepreneurs with combined assets nearing 10 trillion yuan (approx. US$1.4 trillion) is of profound and practical significance in terms of bringing the growth of the GBA to a new level as they will contribute capital, technology, talent, social connections, international perspectives and modern management concepts to the area. Overseas Chinese organizations from the two special administrative regions of Hong Kong and Macao as well as nine mainland Chinese cities, Guangzhou, Shenzhen, Zhuhai, Foshan, Zhongshan, Dongguan, Huizhou, Jiangmen and Zhaoqing, gathered for the first time to participate in the launch ceremony promoting cooperation among locally-based overseas Chinese entrepreneurs. The ceremony marked the start of a series of collaborations among the entrepreneurs. The GBA is a world-class city community built by the Chinese government, an area that can play a leadership role in global economic competition, and one of the world's four largest urbanized areas surrounding a bay or similar body of water, much like the areas around New York Harbor, San Francisco Bay and Tokyo Bay. The 56,000 square-kilometer city community consisting of the two Chinese special administrative regions and nine mainland Chinese cities mentioned above is home to a population of 66 million. The GBA now ranks 11th across the globe in terms of GDP, on par with South Korea, and is one of the most dynamic economic areas in China. The inauguration ceremony of the seventh Supervisory Committee of SOCIA brought together a new honorary presidium comprised of nearly 100 members of the Chinese People's Political Consultative Conference (CPPCC) and well-known entrepreneurs, including Heung Kong Group chairman Chi Keung Lau, Shimao Group chairman Xu Rongmao, Country Garden Holdings chairman Yeung Kwok Kwong, Vanke founder Wang Shi and Suning Commerce Group chairman Zhang Jindong. CPPCC member and Heung Kong Group president Mei Hing Chak formally assumed the position of president of SOCIA, the seventh person to do so. "Overseas Chinese entrepreneurs who have fully participated in the construction of the GBA will leverage this exchange platform to strengthen cooperation with each other in many areas," said Ms. Mei Hing Chak at the summit. "They also plan to implement their innovative brand strategies by targeting outstanding high-tech companies and by utilizing their advantages in resources, experience and social connections, in order to contribute to the integrated economic development of the GBA and provide intellectual support to the nation's deepening reform and opening-up policy."